Clear Read-Only is powerful tool for clearing Read-Only file attribute. 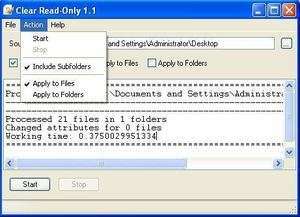 You can easily change all files & folders Read-Only file/folder attribute just clicking Start buton. There are several options like “Include subfolders”, “Apply to files”, “Apply to folders” for customizing operation types. For security reasons, you should also check out the Clear Read-Only download at LO4D.com which includes virus and malware tests. Additional screenshots of this application download may be available, too.